Dear OyG, To update this website you have a few options: You can update it by yourself by using the instructions below OR you can instead submit an update request form for a New Page, or an update to an Existing Page. These will go directly to the OyG web team. Please try to avoid emailing website updates. If you submit a request, please allow two business days for the website update to appear. Thanks! Of course, if you have any concerns or suggestions you can get in touch with the oyg web team at the slack channel #squarespacewebsite. Please let us know on #squarespacewebsite if you make updates. 1. Login to the squarespace site with the login info that you created, and click on the page in the internal list of pages in the grey panel on the left of the live website listed under TOP NAVIGATION. 2. Hover over the text or image regions of this page until you see the EDIT button. 3. Make your edits to text or slideshow. 4. Click Save and your edits are live. 5. Go to slack #squarespacewebsiteupdates and briefly describe what you updated. 1. Find EXHIBITION PAGE TEMPLATE in the grey panel on the left of the website. 3. When settings pane opens, scroll down and click DUPLICATE PAGE button. 4. Type in the title of the new page as the full title of the exhibition, event, or project. Only use initial caps unless your show title is really meant to be uppercase, or lowercase. Also in the "slug" box type the name of the exhibition like this /name-of-exhibition and SAVE. 5. Open that page, hover over the text region and click EDIT and paste or type in your text using the template as a guide to formatting. The larger headline text at the top of the page should be the name of the Exhibition. 6. Hover over the image region and click EDIT. See below on editing a slideshow. Even if you're adding a single image you should edit it as if it was a slideshow. 8. To make the page show as the Current/Homepage or an Upcoming page, please see sections below. 9. Go to slack #squarespacewebsite and briefly describe what you updated. 1. Follow steps 1-6 above, "To make a new Exhibition page"
2. Find the Exhibition Page you just made. Hover over the title only and click the gear. At the bottom of this pane, click DUPLICATE PAGE. 3. For now, leave the title of the page alone. Click on the gear and click SET AS HOMEPAGE. 4. Go to old CURRENT page (or if it's a Skirt Exhibition go to SKIRT CURRENT) hover over the title and delete this page. But don't worry the exhibition page will not be lost, to confirm this just go down the Unlinked Pages and find the title of that recent exhibition in the list. If you see it you can safely delete the current page. If you don't see it please notify someone on the webteam in slack #squarespacewebsite. 5. Drag the new current page so it becomes the first item under EXHIBITIONS. Then hover over the title and change the title to CURRENT. Be sure the url slug is also /current. 6. Note that you will have a /current page with the info with this exhibition AS WELL AS a page called /title-of-exhibition. You MUST have both of these. 7. Go to slack #squarespacewebsite and briefly describe what you updated. 3. For now, leave the title of the page alone. 4. Go to old UPCOMING page (or if it's a Skirt Exhibition go to SKIRT UPCOMING) hover over the title and delete this page. But don't worry the exhibition page will not be lost, to confirm this just go down the Unlinked Pages and find the title of that exhibition in the list. If you see it you can safely delete the upcoming page. If you don't see it please notify someone on the webteam in slack #squarespacewebsite. 5. Please note, if there is no upcoming page. You will drag your new page beneath Current. This will become a new upcoming page. 5. Drag the new UPCOMING page so it becomes the second item under EXHIBITIONS. Then hover over the title and change the title to Upcoming. Be sure the url slug is also /upcoming. 6. Note that you will have an /upcoming page with the info with this exhibition AS WELL AS a page called /title-of-exhibition. You MUST have both of these. 1. Find the UPCOMING page, hover over the title only and click the gear. At the bottom of this pane, click DUPLICATE PAGE. 5. Drag the new page so it becomes the first item under EXHIBITIONS. Then hover over the title and change the title to CURRENT. Be sure the url slug is also /current. 1. Hover over the image region and click EDIT. 2. Click on the Design tab in the top right and set it to match Figure 1. Note: even if it's a single image, please put it in a slideshow. If it's a single image UNCLICK, "Show next and Previous Controls" . 3. Then to add the caption, go back to the content tab, hover on the image, and click the gear in the top left. In the DESCRIPTION box type your caption. See figure 2 below as a guide to how to write captions, or if your caption isn't like this, make your best guess, provide as much info as you can. Leave the TITLE box blank. Click Save. 4. 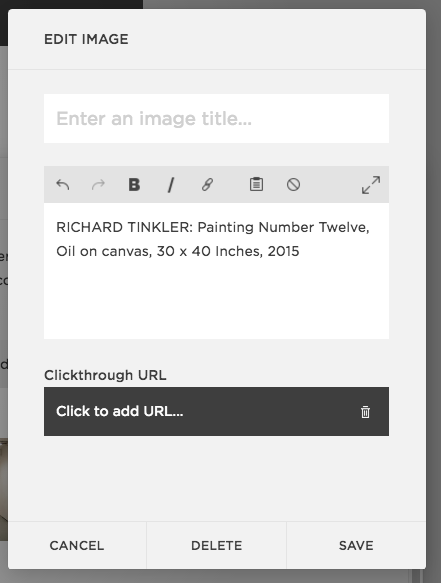 Go to slack #squarespacewebsite and briefly describe what you updated.